As per the Ministry of Transport’s mandate, all new two-wheelers launched after 1 April 2018 will need to be equipped with ABS or CBS. And starting from 1 April 2019, every existing two-wheeler in any company's portfolio would need to come with these safety features. This is for a good reason. It is no secret that automobile safety is paid little to no attention in India. According to statistics shared by the Ministry of Transport in 2012, almost 36,000 people lost their lives due to two-wheeler accidents in India. That accounts for a shocking 26 per cent of total road accidents in that year alone. Given the current state of road safety, ABS or CBS has never been as indispensable. Without further ado, let's take a detailed look at what they actually do and how they differ. In a nutshell, ABS (Anti-lock Braking System) prevents the wheel from locking up. For example, during panic braking in a non-ABS vehicle, the brake force is sent directly from the master cylinder to the calliper. This can result in the wheels locking up. If you're in a car you might still walk away scot-free thanks to its cage-like structure. This isn't the case with two-wheelers, though, where you're bound to go sideways and meet with an accident. To counter this exact problem, ABS is introduced between the working of the master cylinder and brake caliper. When the brake force is applied on an ABS-equipped vehicle, it sends the pressure from the master cylinder to the ABS pump, and then to the calipers. There's also an electronic control unit (ECU), which monitors brake pressure along with front and rear wheel speed, using the speed sensors placed in the fork and swingarm along with slotted rings built into the wheel hub. The Anti-lock Braking System uses these speed sensors on both or just one wheel to determine if the wheels are about to lock up. Only then, a series of hydraulic valves intervene with the rotor and reduce or limit the braking of the wheel. This, in turn, increases the braking efficiency of the rider, allowing him to react and steer away from danger. This system also helps in avoiding unintentional slides in wet or slippery surfaces. It should be noted that the braking distance might vary as per different ABS systems and their calibration. While usually it is aimed to reduce the braking distance, there have been some instances where the bike might require more distance to stop. This is more likely to happen due to external factors like the ABS setting, tyre quality, brakes, etc. On a bad pair of tyres, for example, the ABS is more intrusive and might need some extra distance to bring the bike to a halt. There are usually two types of ABS units: dual-channel and single-channel. On the latter, the system collects data from the front wheel and works only on that. A dual-channel system, however, collects data from both the wheels and prevents wheel locking on both ends. No points for guessing, the dual-channel system is more expensive and can be found on more premium offerings. There's also switchable ABS, usually seen on ADVs or performance-oriented motorcycles. It usually allows the rider to completely turn off the rear ABS, for the wheel to lock up and slide in the dirt. However, some manufacturers allow both the front and rear to be switched off. CBS or Combined Braking System was introduced by Honda back in the 70s. It was implemented in India much later in 2009, with the Honda Activa. Ever since then, it has become one of the most effective ways of braking, especially for new riders. Applying both the front and rear brakes simultaneously is often considered the most effective way of braking. However, novice riders tend to ignore that notion due to lack of practice and experience. With CBS, one can apply brake force at both ends with the mere pull of the rear brake lever. Much like any other riding aid, CBS too is aimed to offer the rider better control while braking. The common tendency in India is to go heavy on the rear brakes so as to avoid a front washout. However, as we know, the best way to come to a dead halt is via maximum effort on the front. With CBS, even if a rider just works with the rear brake, the front is activated as well, to offer equal braking power on both. How is it done? The rear brake only operates when the brake lever passes a certain threshold. This triggers the delay valve to open and the pressure control valve to close, thus reducing the pressure on the rear brake. 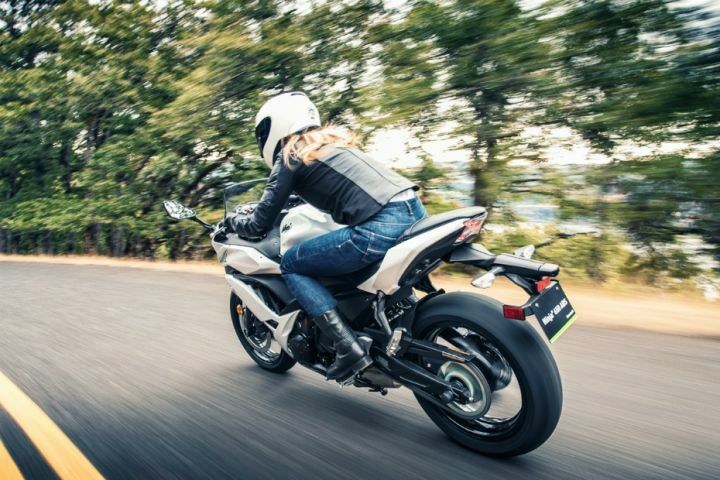 Hence, while it may not reduce the braking distance dramatically, it still helps novice riders to stop in a reasonably shorter distance as compared to a non-CBS two-wheelers. Notably, CBS works on both disc and drum brakes, compared to ABS which tends to works only with disc brakes. Starting from 1 April 2019, two-wheelers above 125cc will need to be equipped with ABS. Meanwhile, two-wheelers below 125cc have to have CBS. Super informative..and easy to understand.. Kudos.. Super informative..and easy to understand.. Kudos..